Mon, 6/19/17: DPW staff to seek input from City Council on final Sidewalk Plan. Click here to read San Rafael City Council Agenda Report. Note: Final vote to happen at a later date. On Monday, Feb 6th at 7 PM at the monthly City Council Meeting (City Hall, 1400 Fifth Ave) the Director of Public Works will be presenting a staff recommendation regarding pursuing a "shared sidewalk and tree maintenance policy within the City of San Rafael Street right of way to ensure that sidewalks are free of tripping hazards and other unsafe conditions". Click here for a link to the full (5 page) agenda item. This has been a long time in coming! It was back in late fall 2015 that the neighborhood and the City mutually agreed to "pause" the discussion of who was responsible for sidewalk & tree maintenance in San Rafael, while the City took time to study the issue in further detail. Gerstle Park (and other neighborhoods) have patiently waited, and we are all anxious to hear what they have to say. We encourage you to read the agenda item and consider attending the meeting in person (or listening to the presentation online on Monday night). A video of the meeting will also be posted on the City's website after the meeting - watch the City's website for that. We are told that most likely, the City Council will not be voting on this issue on Monday night but rather will delay the vote until the March City Council meeting, giving the public time to weigh in. 1.) 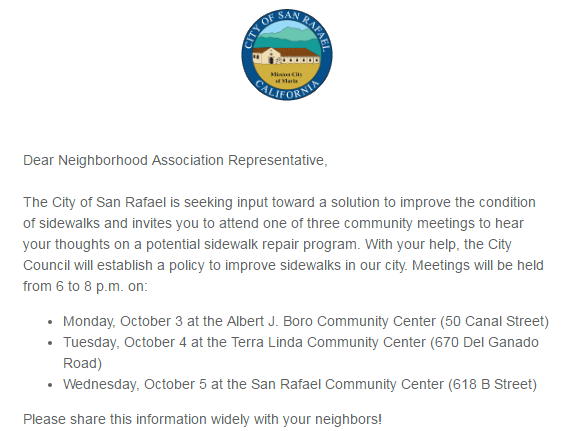 Check below to see if your address in on the list below: The San Rafael Department of Public Works (DPW) has identified 291 properties which are in need of sidewalk repair in our neighborhood. (Use scroll bar at right edge to view complete list of street addresses.) If your address is NOT on the list below and your sidewalk has not been marked by DPW, there is nothing that you need to do at this time. Please note in the column marked "COMMENTS" DPW has indicated locations where it plans to remove and replace street trees. At 17 of these 291 locations DPW plans to remove and replace one or more street trees due to either tree health or safety concerns. Our GPNA Sidewalks Committee is working closely with DPW to develop a Gerstle Park Urban Forest Plan to maintain the beauty and character of the neighborhood. Click here for a MAP of the specific tree locations. NOTE RE: TREE MAP: Only the trees marked with an "X" will be removed and replaced with a new tree. CITY does the work - you do nothing. Click here for more details on that. Do the work YOURSELF. Click here for details about required Encroachment Permit from City. Sign up [by 8/15/15] for the GPNA SIDEWALK IMPROVEMENT PROGRAM arranged with our chosen contractor, Van Midde & Son Concrete (CA State License #676584). In addition to group pricing, the City will waive the Encroachment Permit Fee ($246 per property). Click here for pricing and registration details. Property owners must notify GPNA if they wish to participate no later than August 15, 2015. The contract will be between the property owner and Van Midde & Son. Work to happen starting September 2015. All payments due within 7 days of completion. Email info@gerstlepark.com or call Gina Silvestri @ (415)716-0130 to sign up or to ask questions. Were you unable to attend our Community Meeting regarding the sidewalks? Click here to watch a VIDEO of the 5/20/15 Sidewalks Meeting at San Rafael City Hall. GPNA thanks Community Media Center of Marin for making this video possible! As we announced last year, GPNA has teamed up with the DPW to develop a plan which will give Gerstle Park property owners the most affordable and streamlined process to replace broken sections of their sidewalks, as mandated by state law (Streets and Highways Code section 5610). While we believe our statement is accurate as a general proposition, and is based upon our understanding of California Streets and Highways Code sections 5600-5618, we recognize that the facts of each case may vary, such as those involving damage to sidewalks caused by tree roots, and depending on whose trees are involved, etc., and therefore should be reviewed with competent legal counsel experienced with such matters. While GPNA is in no way seeking to give legal advice to anyone involved, we have made inquiries and tried to present information that we hope will be helpful to our neighborhood residents and property owners confronted with the sidewalk repair actions initiated by the City which affect our quality of life and property values. We have been informed by the City's Public Works Director that there is no San Rafael Municipal Code section regulating this subject, only State law.